This weekly event is hosted by Sheila at Book Journey. and, darn it, I WILL start Under the Dome by Stephen King in August...I will, I will! Have you tanked any readathons lately? 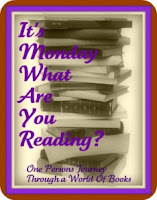 =O) What's on your reading agenda? Your TBR piles look like mine! I keep making progress (but adding to the piles), so it's a draw. Yet another Read-A-Thon...yes, I'm obsessed! Some news on the blogging front! BBAW is on its way!